The Statue of Liberty and the bald eagle are two of the most enduring symbols of American freedom and power. The bald eagle was selected as the national emblem in 1792 because of its power, majesty, and longevity. Lady Liberty was given to the United States as a gift from the people of France, and has stood in New York Harbor for over 130 years as a welcoming face for millions of immigrants. 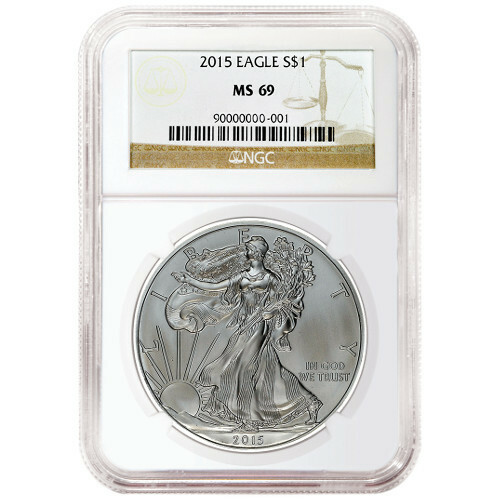 Today, you can own a piece of Americana with the purchase of a 2015 1 oz Silver American Eagle coin. These coins come with an MS69 grade from the Numismatic Guaranty Corporation. Ships in a plastic NGC slab. Graded at a near-perfect MS69 condition from NGC. Congress authorized production of the Silver American Eagles in 1985 when the Liberty Coin Act was passed. 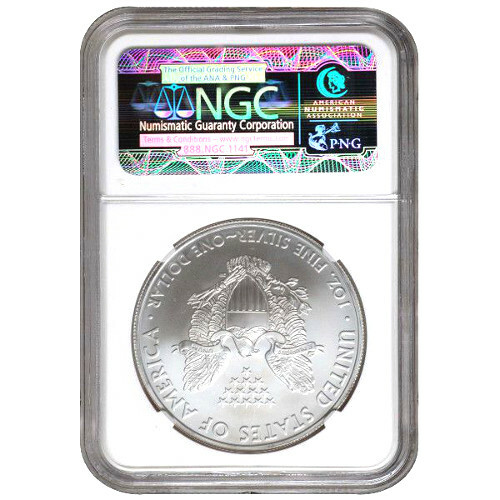 The first coins were minted in 1986 using silver from the Defense National Stockpile. Adolph A. Weinman’s Walking Liberty design, first used on the Walking Liberty Half Dollar between 1916 and 1947, is featured on one side. John Mercanti, the US Mint’s chief engraver, designed the heraldic eagle featured on the opposite side. Like many other official silver bullion coin programs, the images on the Silver American Eagles never change. 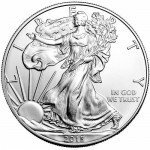 On the obverse side of the 2015 1 oz Silver American Eagle is Weinman’s Walking Liberty. Lady Liberty is depicted striding toward the setting sun. Engravings include “Liberty,” “In God We Trust,” and the year of minting, 2015. The reverse side bears Mercanti’s eagle. The bird is set behind a shield, clasping an olive branch in one talon and arrows in the other. Directly above its head are 13 stars, representing the original American colonies. Engravings on this side of the coin include “United States of America,” and the weight, purity, and metal content of the coin. Congress established the United States Mint in 1792 with the passage of the Coinage Act. Since that time, the facility has grown to include four minting operations across the country. The US Mint is the primary facility responsible for the production of coins for the federal government, including both circulating currency, collectible coins and bullion coins. An MS69 grade from the NGC means a coin has an attractive strike and fewer than two blemishes on the coin’s surface. 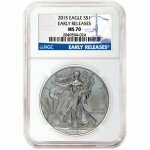 If you have questions about these Silver American Eagles, or any other Silver.com product, simply call us at 888-989-7223. We’re also available to answer any of your questions online through our live web chat feature or by email.